As sad as it is to see the Super Eagles out of the World Cup, the fun is far from over. And with quarter-final action beginning with Uruguay vs France this Friday, there’s plenty more to look forward to. We decided to take a look at the one World Cup ritual that barely gets a look in – the national anthem – to see how the songs of the competing nations match up, and the clues they give to each country’s identity. Uruguayans are a proud people and their national song speaks to this. At nearly 6 minutes long, “Orientales” is the longest anthem in the world. We only hear a fraction of it before every match in Russia, but if the song is any indication of their playing style against France, Uruguay will be opting for the long game. France have been slicing through defences this World Cup with brutal efficiency (Mbappe anyone?) and that dovetails neatly with “La Marseillaise”, a brutal call to arms that asks the French to fight for what’s theirs. Does that include a World Cup trophy? La Marseillaise was adopted from 1795-1799 before being reinstated as the country’s official song from 1870 onwards. The birthplace of samba and capoeira has a suitably uplifting anthem, set to the lyrics of a poem written by Joaquim Osório Duque-Estrada. The song became official in 1922 and is the sort of jaunty tune that should give some lift to Neymar & Co. as they look to get past Belgium with trademark swagger. Belgium is multicultural, and it has an anthem that represents that. All the way back in the 1830s, The Brabant was created in three languages: French, Dutch and German. Today, Belgium is even more diverse, but the song continues to represent the country pretty well, and hits a rousing crescendo that raises the hair on your arms. Enough to see Martínez’s men to the next round? Time will tell. The Russian anthem is stoic and at times spectacular, especially when sung by 80,000 football fans in unison. In comparison to some of the songs on this list, it’s a fresh face, becoming official only in 2000. Word has it that Putin keeps a steely eye on the way it’s performed by his players; you can expect an A-grade rendition come Saturday as the host nation takes on Croatia. Croatia’s national anthem was first used in 1972 and is unofficially called “our beautiful”, which might give some indication of the way Croats feel about their country and their people. Croatia has been playing beautiful, swashbuckling football at this year’s World Cup. But will be enough to see off the Russians and their vociferous supporters? Scandinavian countries tend to be pretty diplomatic, and they don’t go in for too many hard and fast rules. True to form, Sweden is so restrained, they haven’t had the heart to officially set a national anthem in stone. “Du gamla, du fria” is used instead; an old folk song from the 1930s. Will Sweden’s lack of cutting edge hurt them against England? England has done a good job exporting their anthem around the world. It’s one of New Zealand’s two anthems, and it gets airtime in countries including Australia, Canada and Barbados whenever the royal family visit. England’s ode to the Queen is one of the oldest anthems in the world, which may be why no one knows who actually composed it. How good is your national anthem knowledge? 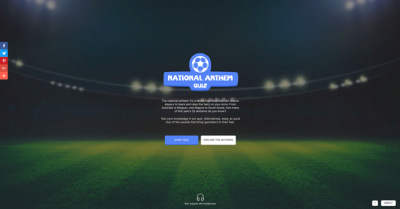 Think you can ace a national anthem quiz and prove yourself to be the best? 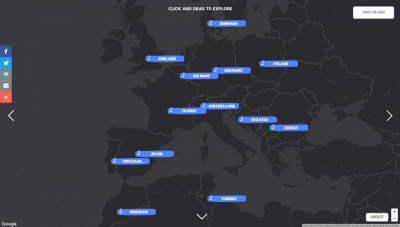 Try out this cool national anthems game and you might learn a thing or two in the process as well!